A few days back, I had posted a mind map of Linux distributions on this blog. And I received a flood of suggestions, criticisms and ideas. And guess what ? I have included (almost) all the ideas and suggestions made and have seriously taken into consideration the criticisms as well. 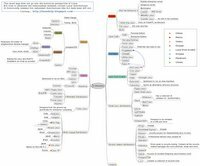 The end result is this updated mind map of GNU/Linux with even more Linux distributions included and some color coding thrown in as well. But the challenge was in making the mind map retain its clarity even after all these changes. At the same time, I also wanted to restrict the size of the resultant image. And I think I have succeeded to a certain extent in this endeavor. Fig: Mind Map of GNU/Linux distributions (Ver 2). Click on the image. Rectified some mistakes pointed out earlier. The map now has a pure white background. So is much more clear. I have left out a couple of Linux distributions, especially those which are historically significant but which are not under active development like SLS, erstwhile Red Hat, Yggdrasil and so on. This is because I felt the mind map should mirror the state of current Linux distributions rather than be a historical time line of them. Secondly, including these will also make the map more complex and I wanted to retain the simplicity of the mind map. And excluding such historically significant but redundant distributions helped in achieving this. Hopefully, I will be able to add more Linux distributions as and when I get more inputs and ideas. The credit for this updated mind map goes to all the readers of this blog who took the time to give suggestions, ideas and point out the mistakes on the previous map. Kudos to you all :) . Update: You may download the high resolution PNG format of the mind map file here (File size: 206 KB). Nice work! I wanted to point out that there is now a child project under DSL: DSL-Not. Same development team, the goal is to keep it small but go beyond the 50mb DSL limit. It surprises me that you have Sun Java Desktop under openSUSE; Sun Java Desktop is part of Solaris. This says its Linux port is as good as dead. Were you thinking of Novell Linux Desktop, or is there a connection I'm not aware of (certainly possible)? I'm sure it was hard to choose which the parent should be: SUSE or openSUSE. I can certainly understand why you went the way you did. Again, great work, I think it's really cool to see it presented like this. Excellent image. This was just what I was looking for. Thanks for creating it. PS: You could also differenciate the image according to the LiveCDs too. Regarding Debian, Testing is known as Etch, and Unstable is known as Sid (you had these the other way around). MUCH better. Thanks. It's on my office door with a picture of Linus! Great work! Very easy and visual way to portray things, and it looks basically to be pretty correct and complete. Nice changes in v2. One thing, though: rPath Linux and Foresight have no real relationship with Linux From Scratch. They are more closely related to Fedora in the way the system works (init scripts, etc). As has been said before, Arch is not based on LFS. It shares *nothing* *zero* *zip* with LFS. It uses an entirely different init scheme, config scheme, and installs files in entirely different places. Arch ought to be out on it's own, it is not based on any other. Linspire is based on debian, and uses dpkg and apt under all the gui. Nice graph, very interesting to see which distro is built on which. However, as a person with an interrest in visualization I still see room for improvement. If you make a version 3, I hope you'll take my feedback into account. You're trying to show two things: the relationship between the distributions and the kind of the distribution (small distro, security distro, language distro, etc). However, you're using one technique (namely the edges between nodes) to visualize both variables. This leads to ambiguity. For example is KnoppixSTD based on knoppix? You're graph doesn't show this because you allready grouped it under Security related distributions. In the same time, you use color to highlight important distro's. Mandriva has a larger install base than Gentoo, LFS, Morphix, Slackware, and possibly Ubuntu, but you didn't highlight it with a color for some reason. Same thing with SuSe. So, I don't understand the purpose of the color code. Linspire and Kurumim are based on Debian, too. INSERT is another security related distribution you might consider adding. It's under active development and has proven its worth as a recovery distro for partition related issues (amongst others). It's based on Knoppix and incorporates some ideas from Damn Small Linux. Considering live CD's, perhaps you could add an icon to distributions meant to run from CD? Very nice map! It would be cool if the individual distros were clickable to get to the distro's home page. The colours for Debian, Knoppix and Ubuntu are hard to tell apart when they are spread over the mindmap, you might want to redo them to be more destint, it makes things a a bit confusing to understand if you don't know the distros. Nice map! One suggested addition: . It describes itself as "Building a Sparc Linux Distribution based on Fedora Core. Please note that Aurora is not in any form or fashion affiliated with Sun Microsystems, SPARC International, or Red Hat Inc."
FYI, Damn Small Linux is a minimalist distribution that has a number of custom extensions for easy install of programs, such as Audacity, Gimp, Openoffice, etc, it really is easy for the newb and fun for the experienced to get it going on low end computers. Also you may want to consider converting the image to PNG or GIF, which is optimized for this type of image with lots of whitespace and few colours. In the first version, Mandriva and RedHat were close, which is logic as both are RPM-based, and Mandriva originaly was a RedHat. In the 2nd version they are away, is it intentionnal? Slight correction, SELinux does not add ACLs to linux. It adds Mandatory Access Controls (MAC) in the form of Type Enforcement and Role Based Access Controls. i'm also not sure I would consider it a "distribution", it is a kernel module and set of user land tools that is integrated into most mainstream distros. Great work. Thanks! You could have this made into a poster sized print and sell it. Lots of Lunux/OS geeks would buy it if decently priced. Very useful! I think you should include some special distributions like ClusterKnoppix - live CD for building clusters, Quantian a mathematical version of CLusterKnoppix and CDmedic a special version for handling MRI-scans and PACS. Nice map! Though I always were under the impression that Mandrive (Mandrake) was derived from Fedora (Red Hat)?! Being a recent convert to Mepis, I have to complain that it is not (yet) a derivative of Ubuntu. The upcoming version that is currently in alpha is supposedly going to be Ubuntu based, but the current release (3.4.3) is not. Hi! Not a criticism as such, but don't you think Mandriva should actually be branched off of RedHat? I mean, that's what it was essentially to begin with, RedHat with KDE. Or maybe not, Mandriva's certainly its own distro now. Archlinux is only inspired by CRUX, what is that arrow for? Not sure if listing Pocket Linux in two places (Minimalist Distros and Slackware) was intentional or not. If so you would probably want to put the Slackware "blue dot" on the one that is not in the slackware branch. Oh and second the Live CD suggestion. I'm a Mandriva user, and I would have suggested that you somehow indicate the family resemblance between Mandriva's Mandrake heritage and RedHat/Fedora. I found it easy to move to Mandrake from RH because of the family resemblance, and SuSE is reasonably close (but farther), versus Debian, which is quite different. Mandriva also seems to qualify as multi-lingual, because of its Euro/Brazilian makeup, it pays more attention to multi-lingual issues than some other distros. I'm a linux newbie, and I can say this is one of the most helpful things I've ever seen. Great job mapping out all the relationships! It really helps someone like me distinguish between different branches of the distro families. I thought Linspire was based off of Debian? There's a good chance I'm wrong on that, college is killing my brain..
Leaving out RedHat and placing Fedora and Mandriva so far apart will leave people wondering why they both use RPM; furthermore, why use two classification schemes in one image? Minimalist, multi-lingual (do you mean unilingual?) and security related distributions are clearly functional classes, not ontogenic (historical) ones. Slax is a Slackware based distro...you can take slackpacks and install them on Slax. I some ways, it is closely related to ZipSlack, a versoin of Slackware that will fit on a 100 Meg Zip Disk. Excellent. Great work. Suggestions: posting the 'active' version that allows folding/unfolding and/or links to the websites of the various distros. A very nice diagram - thanks! It might be cool to add a category of single function utility "distributions" - I'm thinking of tools such as http://home.eunet.no/~pnordahl/ntpasswd/. Thanks for the work - it will be fun to watch this mind map grow! Some info on the Novell SUSE dist. Starting with SUSE we branch out with openSUSE, SUSE Linux Enterprise Server, SUSE Linux Enterprise Desktop. Starting with SUSE Linux Enterprise Server we branch to Open Enterprise Server. Excellent work. I do almost all my computing under Kanotix, and am shure that Kano would be the first to acknowledge that Kanotix is a child of Knoppix. A very robust child, perhaps even surpassing its orgins, but descendant nevertheless. Nice graphic! However, I believe linspire is based on debian. Much better this time around. I was rather annoyed by the first one you posted. This is cool -- one suggestion -- Linspire is a child distro of Debian. - Rpath linux is not a linux from scratch, it has it's own package manager very different from others, and uses some red hat tools (so do foresight linux). Could someone explain the arrows linking frugalware, arch linux, crux linux and rubix? Does this mean that frugalware is a mix of arch linux and slackware? Linspire is based on debian and it is marked as such - check the colored dot on the linspire label. The reason it was listed seperately was because it has evolved much and has little sembelance with debian. Mandriva is of course derived from red hat 6.2 (prior to fedora). But since I have left out redundant distros, I had no choice to list it as a distribution in its own right. Check the colored dot for distributions which are listed in security related and small distributions category for the parent distro from which it was derived from. and you have them all covered except one. I would place it under security related distro. Improved, but I still think it would be more useful to see it in terms of an historical or family tree. Was there really a distro called "Security-based distributions" that gave rise to all the rest? (Okay, I know there isn't, but it would be more useful to know, for example, what P.H.L.A.K. sprang out of rather than to see it clumped with distros it is completely unrelated to. Great post ravi but you have one thing very incorrect. SuSE did not come from gnu/linux, it came from slackware. S.u.S.E was founded in late 1992 as a UNIX consulting group, which among other things regularly released software packages that included SLS and Slackware, and printed UNIX/Linux manuals. They released the first CD version of SLS/Slackware in 1994, under the name S.u.S.E Linux 1.0. It later integrated with the Jurix distribution of Florian La Roche (also based on Slackware), to release the first really unique S.u.S.E Linux 4.2 in 1996. Over time, SUSE Linux incorporated many aspects of Red Hat Linux (e.g., using RPMs and /etc/sysconfig). Quite useful. Just a minor suggestion: could you please put a date of creation (i.e. 24 Apr 2006) on the map, as the map will become "dated" in months to come.... Looking forward to periodic release of updated maps. Best wishes. AC. "historically relevent" --> "historically relevant"
Sun Java Desktop System (Linux) was built ontop of SuSE SLES-8, the next version V3 was to be built on SLES-9 but was never released. If this map is seen well where they show the distributions that can be said the main ones and those that are come off these, in the only thing that I do not agree is in the part which they put because RedHat Enterprise Linux drift of Fedora, being that is all the Fedora opposite drift of RedHat since the distribution of Fedora is what the unstable part of RedHat could be said, in which test its of yield of software so that in a future to be able to include it in RedHat Enterprise Linux. Si se ve bien este mapa donde se muestran las distribuciones que se pueden decir las principales y las que se desprenden de estas, en lo único que no concuerdo es en la parte que ponen como que RedHat Enterprise Linux se deriva de Fedora, siendo que es todo lo contrario Fedora se deriva de RedHat ya que la distribución de Fedora es lo que se podría decir la parte inestable de RedHat, en la cual hacen sus pruebas de rendimiento del software para que en un futuro poder incluirlo en RedHat Enterprise Linux. May want to add Openwall, an OpenBSD-style security-enhanced Linux server O/S (no X server) by Alexander Peslyak, A.K.A. Solar Designer, the maker of John the Ripper password cracker. This is great. I really appreciate the work and time you've put in. One thing, I'd remove all the LIVE CD versions and put them in their own map. Also, the organization is goofy. You started off organized by derivation, then switched to characteristics such as security and size, then patched that up with colored dots. The obvious thing to do is stick with the derivation organization for everything, snd note characteristics in the comments, perhaps augmented by colors (but as the color-blind fellow said, don't diffentiate by color; color should only be a secondary indicator). And a dotted or dashed line is the the traditional way to indicate that an item is inspired or influenced by, rather than derived from, another . And of course it's only Mepis 6, currently Alpha, that is derived from Ubuntu; all previous versions were derived from Debian. I anticipate there will be several versions of this excellent graph generated over time. A version number or the date of generation would be a good addition to the box in the upper left-hand corner. I concur with the idea that the structure should be based strictly on genealogy, to which further characteristics can be added by some code, not being primarily based on color. The arrows leave me guessing too as they are not explained. "Multilingual" is a misnomer for (most of) the distros included in that branch, as they are targeted a single language. Perhaps non-Anglosaxon would be better. It would be nice to flag fully unicode compliant distros (which AFAIK do not exist, sadly enough, so make that "as unicode compliant as possible"). But tell me, is it me who's still too tired or is Fli4L and Eisfair missing in your mindmap? However could you please make it available in a vector-based format like ps, pdf, svg or anything similar (even emf would be ok). - BackTrack (a derivant of SLAX) could have a link to the security related distros as well - it is a live CD for security/network penetration testing, including lots of forensics tools as well. Nice work; might be better yet to post its source too so maybe some would elaborate on particular subtrees. Aurox is the Polish version of Linux built on top of Fedora. You can even create your own customised LiveCD with only the software you need, and download it as an ISO. Just want to mention Agnula/Demudi. It's an audio-centric Debian child. Would be nice if ROCK Linux and it's sucessor the T2 SDE could be included. The later gains more and more popularity in the cross compile embedded development. Kurumin is a knoppix derivative! I'd like to mention Sourcemage GNU/Linux, a descendant of Sorcerer Linux. There is also another Sorcerer offspring: Lunar Linux. It is source based like Gentoo but has it's own packet manager. It was already said above but it is worth noting that Turbo Linux was originally a somewhat customized version of RedHat 4.2 and possibly before that. I'm not sure what they do now but for a while there they were using RPMs. So unless they are radically different now, they belong under the RedHat tree. On a funny note, one of the Turbo Linux CDs had a short video on it with Linus saying "Welcome to Turbo Linux." which was obviously filmed with a cheap video camera at some conference that Linus was at. He seemed kinda dismayed that he was saying it. I see no mention of the embedded OSs, like Open Embedded, pdaXrom, CACkO, all under active development for handhelds, all opensource and free. This one is much better ... nice. I believe Xandros is a branch from Debian Stable (Sarge). I'd like to point out that you have missed Openwall/*/GNU Linux in the security distributions section. Could you be so kind to include it to the mind mao? please don't use JPG for graphics. JPG is for photos. Please use PNG or some other lossless format for things like this. Cooperative Linux: Port of the Linux kernel that allows it to run cooperatively alongside another operating system on a single machine. I suspect you could make link to other maps: volwix could point to Games map (important for advocacy and choices). I suppose you need to restrict to only a few themes for these extra maps so it remains good mind map. Also, if you used a OSS freemind or whatever, you should say "map created with xyz" on the map: non linux person will see your map. Damn small linux is based on knoppix wich is based on debian, isnt it? "I used Crux before starting Arch. Arch started out as Crux, pretty much. Then I wrote pacman and makepkg to replace my bash pseudo packaging scripts (I built Arch as an LFS system to begin). So the two are completely separate distros, but technically, they're almost the same. We have dependency support (officially) for example, although Crux has a community that provides other features. CLC's prt-get will do rudimentary dependency logic. Crux gets to ignore lots of problems we have too, since it's a very minimalistic package set, basically what Per uses and nothing else." Great graph, I've put it as my desktop background. I second the idea of Titusjan (many posts higher) to make the graph hierarchical. It will make it more clear. Maybe you could also think about how to visualise distro's belonging to more than one category. I also strongly second the idea of releasing the source of this graph. Instead of "multilingual" and "non-Anglosaxon", how about "localized", "region-targeted" or "country-specific"? Another possible way to combine both the current and the historical links would be a tree where the dead Distros are slightly grey-faded. This would solve the problem that a current Distro based on a dead one could still be branched off a greyed out one. Nice image, non-sense fact. Not timeline. Information value = 0. Ubuntu stands on top of Debian, but Debian takes effort from Ubuntu too. This should be taken on mind even we are reading from Debian people that there is nothing that Ubuntu is giving back to Debian community. Cool! Just what I was looking for. Great informational value. I can now find out just by a glance which distributions are derived from which and also decide on which kind of distributions are most suited for me depending on the size of the distributions. Maybe I will settle for Slax. Nice work! Your MM is great for all of us who are not as aquainted with all the ditros as others here. Keep up the effort. It's a Gentoo based distri optimized for VIA EPIA-Boards. just wanted to tell you about a project i started befor hearing for yours. much more exhaustive but less "human readable" than yours. You left out a few distros ... But for the most part ... It's GREAT ! Check out my Linux / BSD blog ! Tagged. Great stuff. We need more technology lineages like this for all kinds of software, lest we forget our roots. Hi! I've been reading your blog from the beginning..Thank you for your wonderful work! Keep up the good work. Great work, boot it's getting out of date! Please keep it utd!